All The Little Extras: Hole-y Mother of Cream Cheese - Homemade Bagels! Hole-y Mother of Cream Cheese - Homemade Bagels! I spent a fabulous fortnight in the U.S.A. last December and hands down the best thing I ate for breakfast was the humble bagel. Bagels in the past had always underwhelmed me - I really just thought of them as doughnut shaped bread rolls. But that's essentially what they are this side of the Pacific. Which is a shame because they make a fantastic vehicle for glorious swirls of cream cheese; flavoured or plain. Ever since I got home, I've been on the look out for the 'real thing' here in little old Perth. With no luck, I decided to take a stab at making my own. Read on for my recipe! On the subject of fillings; my absolute favourite has to be cream cheese. Specifically, cream cheese mixed with jalapeños, chives and cheddar cheese. We don't have the fluorescent orange cheese that only seems to exist in the U.S. but a nice, bitey vintage cheddar makes a good substitute. You could also try adding chopped bacon or garlic or chopped smoked salmon. Simply mix your favourite flavours into softened cream cheese. Easy! 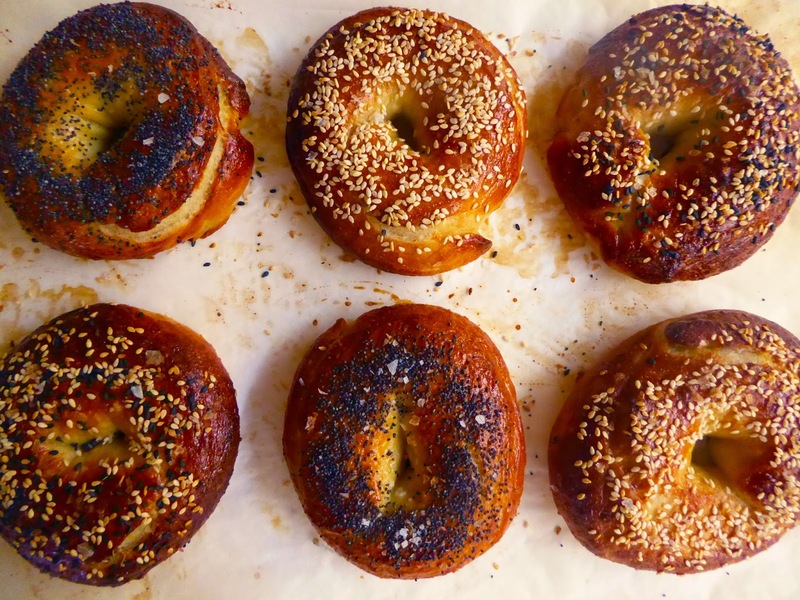 Bagels can be topped with any number of things or can be kept plain if you're boring. 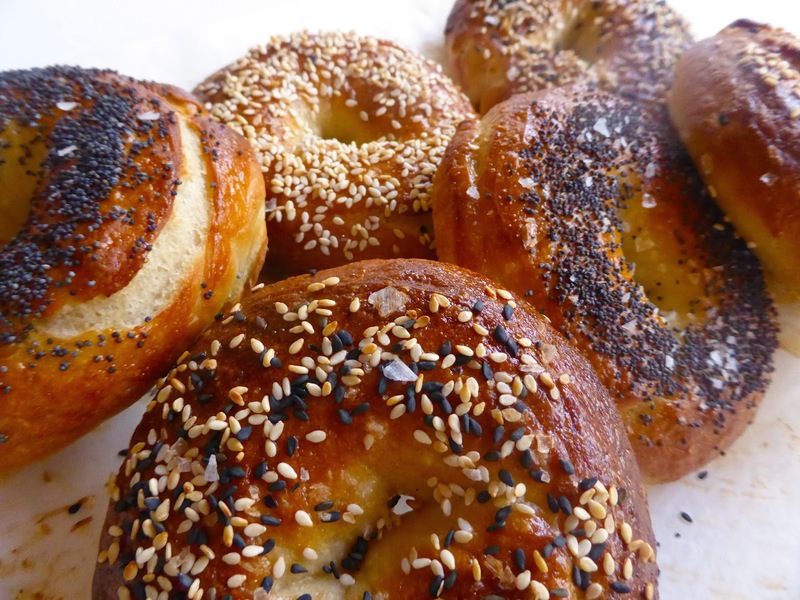 My favourite type of bagel is the everything bagel which is topped with sesame seeds, onion flakes, poppy seeds, salt and garlic. Unfortunately, the high temperature needed to get these babies to bronzed perfection tends to burn the onion flakes and garlic to acrid little crisps which is no bueno. Speaking of which, don't be afraid to let these guys get nice and brown in the oven. In the past, I'd always been afraid of letting bread get truly brown while baking because I thought it would get dried out and hard. My idea of golden brown was more of a golden blonde which really meant that my bread was always underbaked. Just remember that brown crusts mean that it's flavourful, delicious and most importantly - baked! 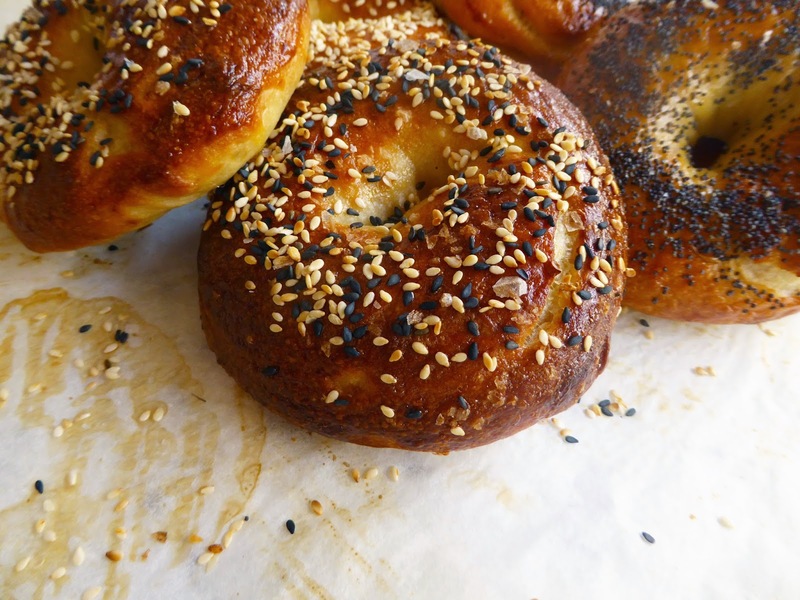 Bagels are best on the day that they're baked but these do pep up a bit if you toast them a few days later. 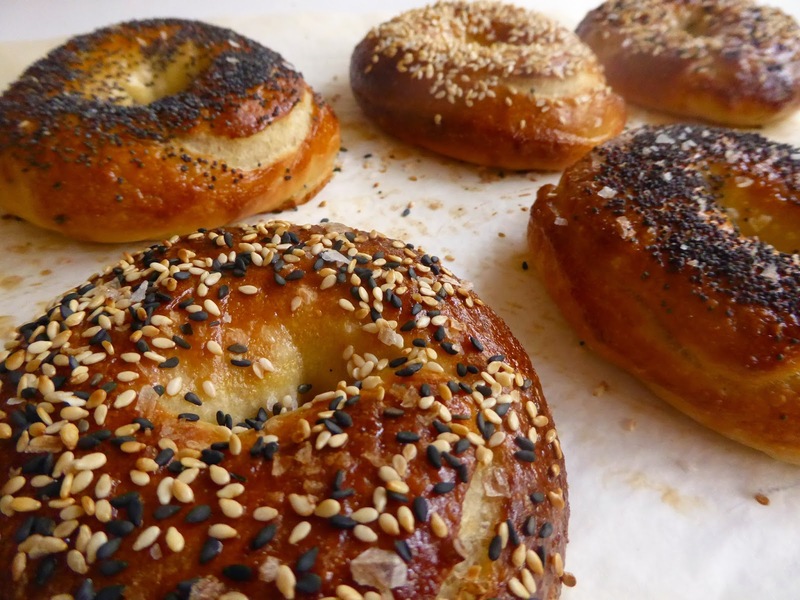 Real bagels are made to be chewy - and while these do puff up a bit, they will give that jaw of yours a workout. They're definitely not just burger buns with a hole in the middle so don't expect pillowy puffiness here. These delicious rings of golden goodness can be topped with any number of awesome things. Sesame seeds, salt flakes, poppy seeds, grated parmesan cheese - the sky's the limit! I'm yet to find a way to stop onion flakes from burning so my quest to make the perfect everything bagel continues. If you have some kind of onion flake magic trick, please let me know! Mix flour, salt, sugar, yeast and water in a stand mixer with the dough hook attachment. Mix until dough is elastic and smooth. On a medium speed, it took my machine about 10 minutes. The dough should be soft but not sticky. Place dough in an oiled bowl and cover with cling film. Prove overnight in the fridge. Divide dough into 8 even portions. Roll each portion into a snake and roll ends together to form a bagel shape. There should be a disproportionately large hole in the middle to account for a second proof and the rising in the oven. Prove bagels on greaseproof paper squares (these help when placing the bagels in the boiling water) for 1 hour in a warm spot. Fill a saucepan with a few inches of water. Add baking soda, salt and sugar. Bring to a simmer and poach each bagel for a minute on each side. Drain, then place on a parchment lined baking sheet. Brush with beaten egg and top with your topping of choice. 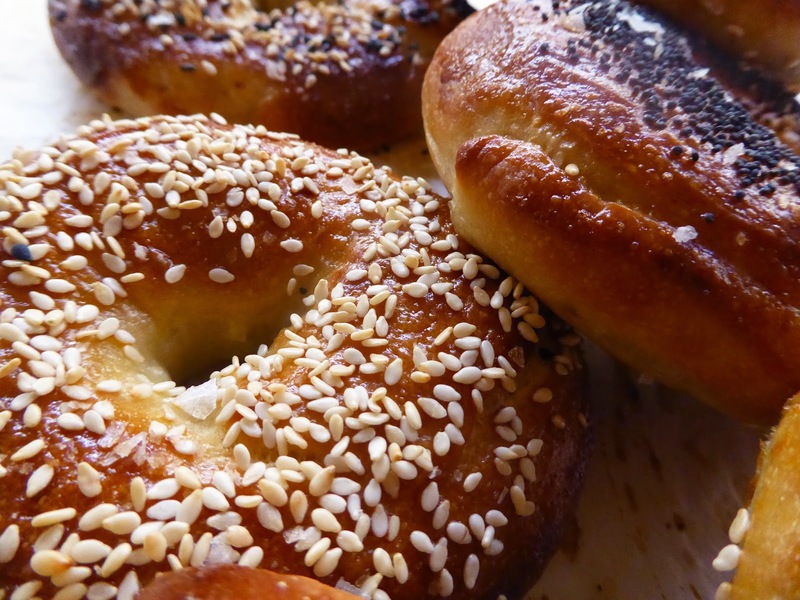 Bake at 220°C for 12 to 15 minutes or until bagels are a deep golden brown. Allow to cool slightly before smothering in cream cheese and stuffing in your face. Thanks for the easy recipe. I am going to try it now. This bagels look super tempting!! Nice recipe.